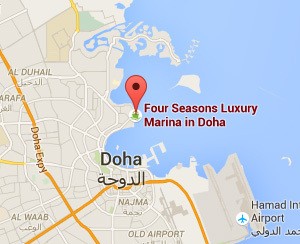 Located only 15 minutes from Doha International airport and adjacent to the Four Seasons Hotel the marina features 112 berths for yachts up to 35 metres and is part of the Nobu restaurant development. Boaters enjoy easy access to the Doha Corniche and members can take advantage of a membership to the Four Seasons Hotel facilities. The marina also offers a boat ramp, round the clock security, dockmaster assistance, along with seven-day per week fuel service for both diesel and petrol. With seven restaurants and lounges, a three-storey Spa and Wellness Centre, comprehensive business facilities and a private beach, Four Seasons Hotel Doha has something for every boater.